Home » FAQs » What are Features & Benefits of Installing a Furnace Humidifier in Your Home or Office? Installing a whole house humidifier to work with your home furnace will provide optimal humidification throughout your entire house. Whole house humidifiers work with the home furnace to distribute moisture efficiently to all living areas, whereas portable models are only capable of treating moisture areas in smaller areas. Humidifiers installed with the home furnace use little energy and require minimal maintenance, making them a more user-friendly option. Health improvements from treating dry air throughout the home. Home furnace humidifiers have been shown to improve lung health, alleviate allergy and asthma symptoms, and lessen instances of illness. Improving home comfort during colder months. Proper humidification of the home can make the space feel warmer with lower temperatures. The minor amount of energy consumed by the home furnace humidifier leads to a great savings in energy consumed by the heating system to keep the home warmer when air is drier, saving users money. Protection of the home. When humidity levels in the home are kept balanced by a furnace humidifier, the damaging effects of dry air are kept at bay. Wood flooring, cabinets, furniture, and other fixtures are protected from cracks and drying out. Static electricity in the home is also reduced when air is properly moisturized. Whole home humidifiers are installed to work directly with the home furnace system. There are three main types of home furnace humidifiers, which operate differently. Bypass humidifiers are installed on bypass ducting and work only when the furnace is in use. They do not have a motor, thus rely on the furnace’s blower motor to circulate air through the humidifier to be moisturized by the water panel and moved into the home. 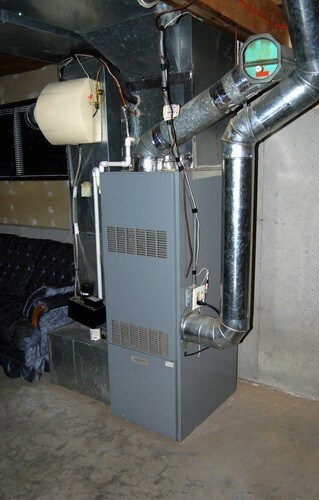 Fan-powered humidifiers are installed on the furnace’s return or supply plenum. They use a built-in fan to move air through the humidifier’s water panel, so they can be used even when the furnace is not running to supply adequate humidity to the home whenever needed. Steam humidifiers boil water, creating steam which mixes with air circulating through the home furnace. Steam humidifiers produce more humidity than bypass and fan-powered models, but do draw more power to operate. Home furnace humidifiers treat the entire home without the need to purchase multiple portable units or move them from room to room. Home furnace humidifiers require less maintenance than portable humidifiers. Portable humidifiers must be filled frequently, while whole home models are directly plumbed to a water source so filling a reservoir is not required. Portable units must be cleaned and descaled regularly, while whole home models require annual maintenance only. What are the features and benefits of installing a furnace humidifier in your home or office? What’s the difference between bypass and fan-powered humidifiers? Why is my humidifier leaking and how do I fix it?